When he arrived at the 1956 Olympics in Melbourne, Chris Brasher's claim to fame was the part he played in Roger Bannister running the first sub-four-minute mile. Cambridge graduate Brasher had become friends with Bannister during their university days and both he and Chris Chataway were recruited as pacemakers when Bannister made history at Oxford's Iffley Road track on 6th May 1954. By the end of the Games, Brasher had something Bannister didn't - an Olympic gold medal. Britain had not won a track and field gold since 1936, and Brasher was not fancied to end the drought in the 3,000 metres steeplechase. He was rated behind team-mates John Disley and Eric Shirley, but qualified comfortably for the final, fourth of five qualifiers in the second heat. In the final, Brasher was just behind Hungarian Sandor Rozsnyoi at the bell. He clipped Ernst Larsen as he cleared the fourth-last hurdle, but the Norwegian did not lose ground. With 300m left, Brasher sprinted for home and moved clear of his rivals to win gold. Or so it seemed, but a twist in the tale saw Brasher disqualified for interfering with Larsen. He went straight to the appeal jury and protested. An anxious wait followed, as the jury did not meet until that evening's competition had concluded, but when it did Brasher was reinstated. He was a co-founder of the London Marathon before his death in 2003. Britain's only gold medal of the Helsinki Olympics in 1952 was won by its showjumpers, led by Harry Llewellyn and his famous horse Foxhunter. A medal of any colour looked an extremely remote possibility after the morning's first round, with the dejected British team down in sixth place. Llewellyn had given Foxhunter only the briefest of warm-ups in an effort to keep him fresh for the competition, but it proved to be an error of judgment. The British team leader had three fences down, a refusal and one-and-a-quarter time penalties. In the second round, Wilf White on Nizefella and Douglas Stewart on Aherlow managed four-fault rounds to lift Britain into third place behind Chile and the USA. Nothing less than a clear round by Llewellyn and Foxhunter could win gold, but they achieved it with ease. Llewellyn, who also rode Ego to second place in the 1936 Grand National, died in 1999 at the age of 88. Tiny Don Thompson was among the favourites for the 50 kilometres walk at the 1956 Melbourne Olympics, and within six miles of the finish he was in fifth place. Then he began to feel the effects of dehydration and, after he had passed the 45km mark, he keeling over and could not get up. Thompson was picked up and taken away in an ambulance. 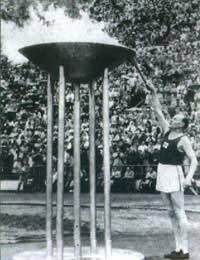 Four years later, at the Rome Olympics, the fire-insurance clerk was better prepared, in part due to an addition to his training schedule. Thompson, who lived with his parents near Heathrow airport, trained in the bathroom using a just-boiled kettle on top of a heater in the empty bath to simulate the heat and humidity expected in Italy. It reached temperatures of up to 110 Fahrenheit as Thompson exercised in the narrow space between the bath and the lavatory. The race in Rome, on 7th September, started in the heat of the afternoon and Thompson, standing only five feet five inches tall, was an instantly recognisable figure, with dark lenses clipped to his spectacles and wearing a cap that his mum had stitched a handkerchief to the back of. After 20km, Thompson was fifth. Of the four men ahead of him, two were disqualified for lifting and two blew up. Thompson led but was caught after 30km by Swedish veteran John Ljunggren. Gradually Thompson eased ahead again and reached the stadium with a 20-second lead. He held on to become Britain's only track and field gold medallist at the 1960 Games. What is great particularly great about the athletic competitors during the 1960 - 1970's was that you basically had to pay your own way. Sports clubs provided the facilities and coaches, Bless them. But generally there was no sponsorship as this was seen as turning you into a professional competitor.